Lucky Fruity 7s Classic Slot Guide & Review - Casino Answers! Lucky Fruity 7s is a 3-reel, 1-line classic slot machine with a wild substitute symbol from Vegas Technology. You can play the Lucky Fruity 7s classic slot machine at VIP Slots Casino and Online Vegas Casino. 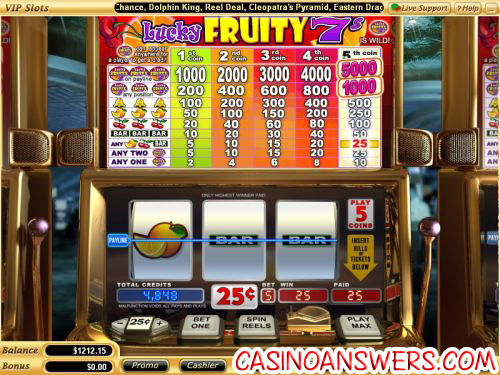 Lucky Fruity 7s uses a lot of typical slot machine symbols such as a single bar symbol, cherries, oranges and bells. The game also has the Lucky Fruity 7s logo wild symbol, which can substitute for any symbol. There are 9 winning combinations in Lucky Fruity 7s. To play Lucky Fruity 7s, first you must select your coin value. Options are $0.10, $0.25, $0.50, $1, $5 and $10. Once you have a coin value, you can decide how many coins you wish to bet per spin. There is no additional value on the maximum bet, which you can play by using the “Play Max” button at the right of the game buttons. The minimum bet on Lucky Fruity 7s is $0.10 per spin, while the maximum bet is $50 per spin. This betting range makes Lucky Fruity 7s ideal for all types of casino players. Once you’re ready to start playing, hit the “Spin Reels” button or hit “Play Max” to play all 5 coins. To win the 5000 coin top fixed jackpot on the Lucky Fruity 7s slot machine, 3 Lucky Fruity 7s wild symbols must appear on the center payline on a max bet. This symbol will also substitute for all other symbols in the game to complete winning combinations. The wild symbol does not need to hit the center payline to complete a winning combination. If three of these wild symbols hit on any position on the reels, you can also win up to 1000 coins. Payouts on the Lucky Fruity 7s are as follows (1/2/3/4/5 coin payouts in parenthesis): any 1 Lucky Fruity 7s symbol (2/4/6/8/10), any 2 Lucky Fruity 7s symbols (5/10/15/20/25), any combination of Orange, Cherry and Bar symbols (5/10/15/20/25), 3 Bar symbols (10/20/30/40/50), 3 Cherry symbols (20/40/60/80/100), 3 Orange symbols (50/100/150/200/250), 3 Bell symbols (100/200/300/400/500), 3 Lucky Fruity 7s symbols in any position (200/400/600/800/1000), 3 Lucky Fruity 7s symbols on payline (1000/2000/3000/4000/5000). To play the Lucky Fruity 7s slot machine and nearly 200 other casino games, get three 100% up to $259 deposit bonuses for a total $777 free in bonuses at VIP Slots Casino. Are players from the United States able to play the Lucky Fruity 7s slot machine? Yes, all Vegas Tech online casinos including both VIP Slots Casino and Online Vegas Casino are welcoming USA players to sign up, deposit and play at their casinos. What is the most I can win playing the Lucky Fruity 7s slot? The maximum win on the Lucky Fruity 7s classic slot machine is $50,000. You can do this by setting your coin value to $10, playing the maximum bet and then lining up three Lucky Fruity 7s symbols on the center payline. If these wild symbols miss the center payline on this bet, you will win $10,000 instead. What is a lucky slot machine to play?